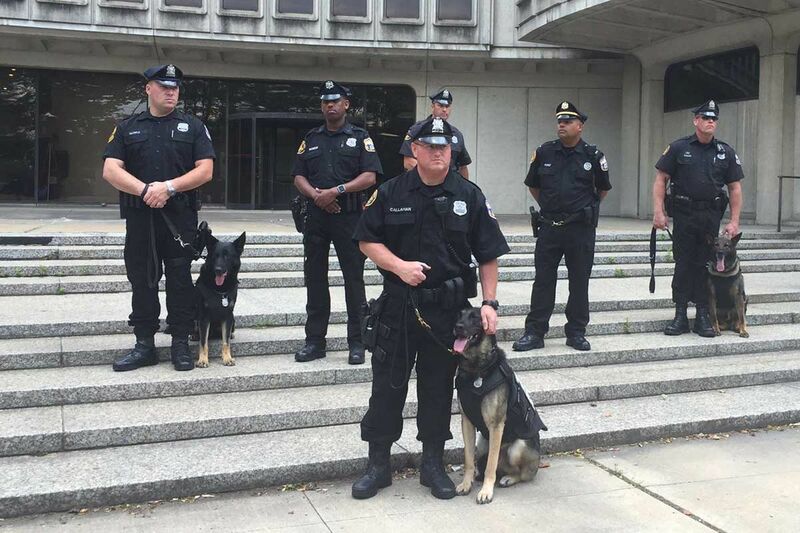 The Philadelphia canine officers, fitted in their new bulletproof vests, stand with their human partners on the steps of police headquarters Wednesday. A Philadelphia woman's desire to have a dog in the fight against crime has inspired her to donate $22,000 to outfit the Philadelphia Police Department's K-9 dogs with bulletproof vests. The donation, made to the Philadelphia Police Foundation by Joanne Berwind, was announced Wednesday at a news conference outside Police Headquarters. Commissioner Richard Ross thanked Berwind for recognizing that canine cops have it ruff too. "They would give their lives for their partners," Ross said of the K-9 dogs. "And they are loyal to this department." Berwind, a philanthropist and widow of Charles Graham Berwind Jr. of the Berwind Group investment management company, is the proud owner of two standard poodles. She said she was inspired to make the donation after reading about a fallen police dog in Virginia and after touring Philadelphia's K-9 Unit. "It was obvious these officers feel the same way about their canines [as I do,]" she said. Berwind worked with the foundation to figure out how best to help the city's four-legged officers. All 23 of the department's patrol-trained K-9 dogs were measured for the canine vests, which cost about $900 each. The vests also offer puncture protection and last about five years according to K-9 Unit Capt. Mark Everitt. The dogs will start wearing their new vests at major events, including the Democratic National Convention next month. Only the K-9 Unit's explosives dog and three cadaver dogs did not get vests because they are not patrol-trained, Everitt said. In his two years as supervisor of the unit, Everitt said he knew of no line-of-duty deaths or serious injuries to any of the dogs. Foundation president Maureen Rush urged all citizens who want to donate to the department to contact the foundation. "Everyone has something they love about giving," she said. "Whatever people want to give to the Philadelphia police, we'll arrange that."